This rate is for two guests, using one queen bed. We can provide extra bedding for a third guest, or the second guest using separate bedding for $30/night. Experience unique, spacious, eco-friendly accommodation unlike any other at One of a Kind Apartments, Dickson. 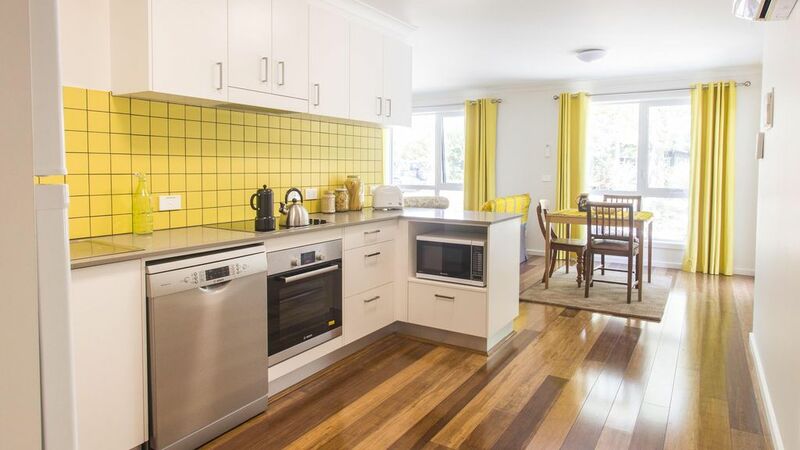 Enjoy spacious, fully furnished, award winning serviced apartments, close to local eateries and just minutes drive from the heart of Canberra. One of a Kind Apartments provide one bedroom apartments, all eclectically and artistically styled on different creative cities. Our apartments are perfect for a business or pleasure stay, and are available for short and long term accommodation. Our spacious, fully furnished, serviced apartments offer an appealing mix of style, function and comfort, with fully equipped kitchens, large rooms and laundry facilities. Take advantage of the finest Sukin Australia toiletries, FREE WiFi, and complimentary secure undercover parking. Our apartments capture the contemporary art museum vibe and are based around a holistic approach to design. Our passion for the past and respect for the future, helps to drive the material and décor choices. We enjoy consuming less, recycling and conserving resources and our accommodation reflects this. Explore the gorgeous local trails with our free-to-borrow bicycles. If an extraordinary travel experience with a conscience is what you are looking for, then One of a Kind Apartments is for you. Great new clean accommodation and friendly service. Definitely recommend and will stay here again. Dear Kayne Morris, Thank you so much for staying with us and taking the time to leave this review. We are so happy to hear that you enjoyed your stay and we would love to welcome you back on your next visit to Canberra.